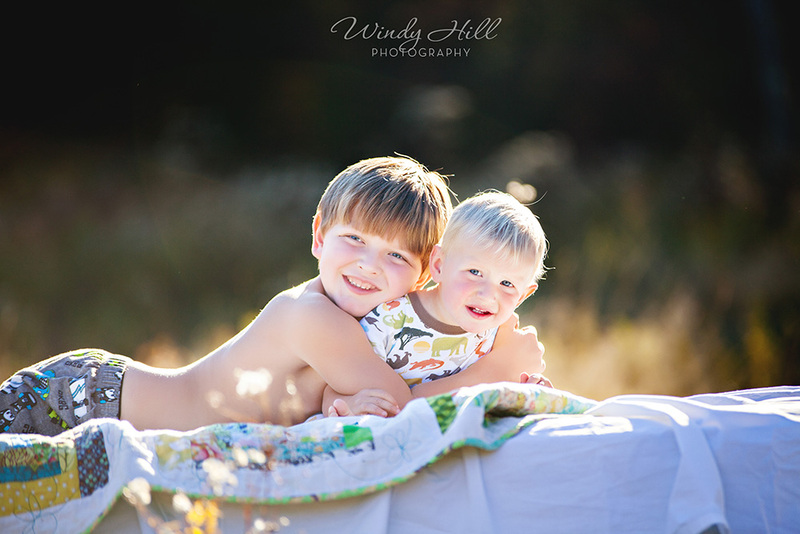 Yesterday in the glorious late afternoon light of fall I got to photograph my two favorite nephews. We had planned on a beach session but when Jessie(my sister in law and mom to the boys) called and said she wanted to use a bed in their shoot I knew the perfect place! It wasn't the beach... can you imagine hauling a bed out onto the beach? gah! ... but a gorgeous field that is filled with amazing golden light. Jessie and I texted back and forth all day long, me with "hey bring this too!" and her with " the truck is full but should I bring?..." The bed was a huge hit but the sun was going down and Jessie and I had lots more ideas! A quick change of clothes and a radio flyer wagon and we were ready! There are so many more shots of this, Blake pulling Lucas, Lucas pulling Blake but I think this pretty much sums up these two boys. I got head of myself just a bit there... in between the wagon and the bed were the superheros! Is there anything cuter than a little boy, wind whipping through his hair, shirtless with a super hero cape billowing out behind him? I don't think so! Unless it's maybe said boy with cape followed closely by his little brother on a hobby horse! Of course in between all of this I was making sure to get photos of the boys all by themselves. They are the cutest little boys around(cause my little boys aren't little boys anymore hehe). At the end of the session as the sun was dipping below the trees, we headed for the last little patch of sunlight, binocular and duck call firmly in hand or mouth whatever the case may be, and we called for ducks and looked at planes and generally had a grand adventure. Jessie thanks so much for coming out and being crazy...errrr....awesome with me. There are so many more, I had the hardest time deciding which ones to post! If you aren't Jessie and you would like a photographic pictorial of your own grand adventure, give me a call or email and let's talk!